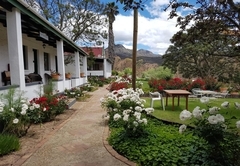 Over the Mountain Guest Farm is a B&B with self catering option, providing accommodation in Herold for tourists visiting the Karoo region. 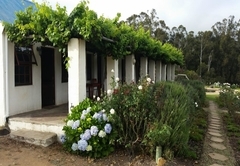 Situated in the secluded hamlet of Herold on the famous Route 62 and part of South Africa’s sublime Garden Route, Over the Mountain Guest Farm offers more than just luxurious accommodation. 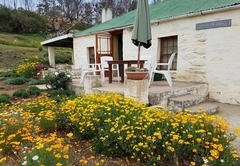 World class accommodation and hospitality are taken a step further with unique, experience based holiday packages that will see guests not only delving deeply into the soul of the stunning surroundings but also taking part in the vibrant art and culinary culture that define this picturesque part of the South African landscape. Make it a destination or a pit stop. 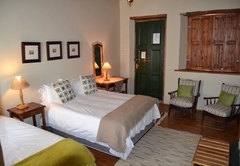 The old Post Office has been lovingly restored and renovated to provide comfortable accommodation across the four en-suite bedrooms. 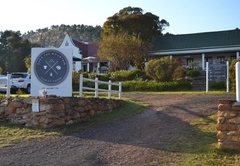 With furniture produced on the farm itself from Blackwood as well as Oregon pine ceilings and floors with yellow wood beams, the characteristic features of the building are accentuated with modern fittings taking the otherwise rustic trappings into the 21st century. Rooms have separate entrances for convenience and each has access to a stunning traditional porch ideal for late afternoon reading and relaxing. 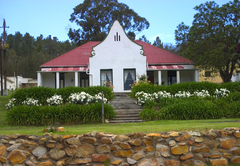 The stunning Welsch House comprises two separate en-suite bedrooms with their own entrances adjoining a self-catering family unit. 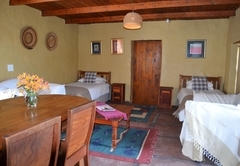 The rooms have wooden floors and reeded ceilings which make for cool summer temperatures and a rustic feel. 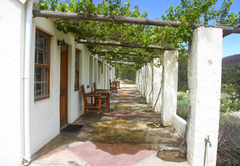 Located on an elevated section of the farm, wonderful vistas of the valley can be enjoyed from the vine covered veranda. 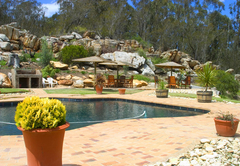 A braai area with swimming pool is situated alongside the Welsch House. 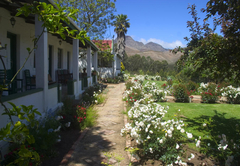 Built from stone and mud during the construction of the Montagu Pass, the House of Grace has been restored to maintain its original beauty with modern necessities being subtly added over the years. 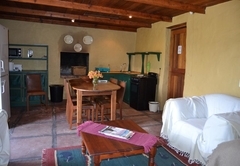 The cottage sleeps six people with two double beds, two single beds, a small kitchen, bathroom, braai facilities and has the most incredible view of the majestic Outeniqua mountains. 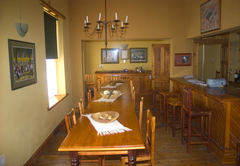 The old Police Station has been transformed into a stunning dining area and lounge which despite renovations boasts original features including the wooden floors, doors and windows adding to the charm of this already idyllic space. 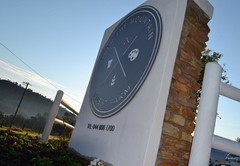 Luxurious accommodation and stunning surrounds are complimented by a handy set of facilities, taking Over The Mountain’s already generous offerings a step further. Secure and convenient parking is made available to guests staying in any of the suites. 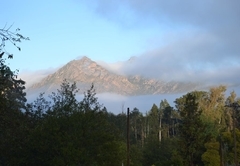 Hiking is available during your stay but you shouldn’t have to hike to your room! 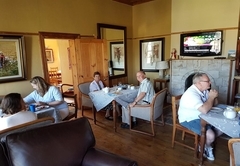 A Wi-Fi internet connection is available in the reception area for those looking to keep up with emails or wanting to post about their phenomenal holiday on Facebook or Twitter. Remember to tag us if you do! 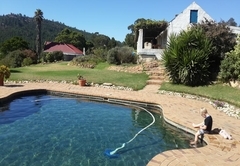 There is a lovely pool on property with ample seating or sunbathing space as well as braai (barbecue) facilities for those wanting to make the most of a hot day. 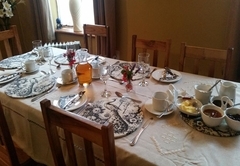 A delectable 3 course meal is made available on request which promises to please any food enthusiasts. The menu changes from night to night so expect something fresh and interesting every evening. 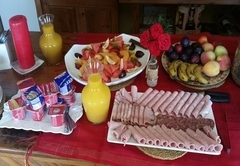 Dietary requirements can be discussed with your hosts on arrival. Local satellite providers, DStv offer an incredibly wide range of programming from popular sports and movie channels to celebrity gossip and local news. Satellite TV is available in the Main Lounge and promises to keep any sports fans or film buffs happy during their stay. 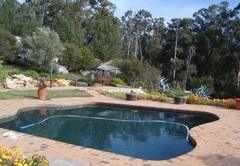 A breathtaking Tea Garden forms part of the property, where guests are welcome to relax out in the fresh mountain air. 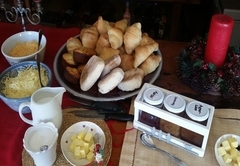 Coffee, tea, scones, cake and toasted sandwiches are served on request. 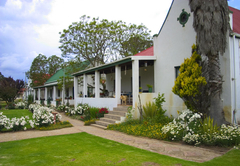 Over the Mountain Guest Farm is less than an hour’s drive from the International George Airport and transfers to the Guest Farm can be arranged on request. 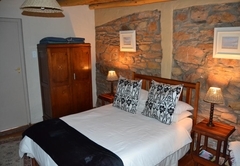 This comfortable room has a double bed and an en-suite bathroom.The unit has a beautiful view from the traditional porch in front of room. 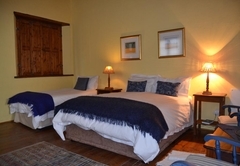 This spacious room can sleep 3 people and has a beautiful view from the traditional porch in front of room. 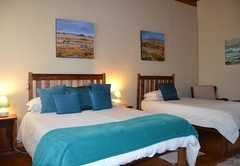 The unit has both a double/queen bed plus a single bed with an en-suite bathroom. 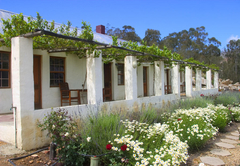 Family Unit - 4 Sleeper: The rooms have wooden floors and reed ceilings and vine covered veranda. 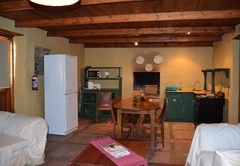 Fully equipped kitchen, one room with double bed, one room with 3/4 bed and 3/4 bed in living area. 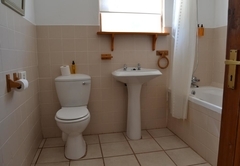 The bathroom is en-suite of the main bedroom with both shower and bath. 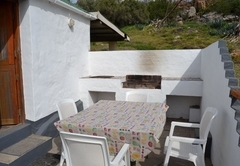 House of Grace Family Unit - 6 Sleeper: The cottage sleeps six people with two double beds, two single beds, a fully equipped kitchen, fireplace and a bathroom with only a shower. 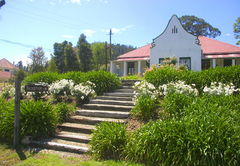 It has the most incredible view of the majestic Outeniqua mountains. Response timeOver the Mountain Guest Farm typically responds to requests in 5-10 minutes.